@Jas – Please try to set example03 (AJAX version) where every drag-n-drop or delete is saved to database. If you have MySQL/PHP skills then preparing local Web server should be simple and easy. All instructions are written in readme.txt files. @Lubo – I’m glad that it fixed the problem. OMG… Absolutely stellar library and examples. I have a request/question… I am trying to build a webpage where I have elements with an employees image, their name and title. How can I have all three elements in one single box that is draggable. When I try and build it, the image can be dragged separately, but I need the entire div treated as one element and draggable. Smile image and text written in the line below should move together. Excuse me. I have a problem. I what to drag images which i use bootstrap img-responsive on it. When I drag the image , it lose it responsive size and back to original size . i want to ask for how to solve this problem. Hi, would like to check with you..
1. Why the dragged item become “Error”? 2. How can i add a col too? 3. How to delete the dragged item if i accidentally drag something i dont want into the table? 1. When i try to modified the table, i realize that the table 3 is a must, im trying to combine table 3 and 1, so the “Trash” button can go with table 1. but the program messed up and drag and drop does not works anymore. Is there anyway i can do so? Last but not least, you did mentioned this “initialize REDIPS.drag library: ” in your post. can i know where exactly this should be initialized? As i cannt find in your index.html code. Hi, is i possible to revert the performed drag operation after the backround ajax failed? Couldn’t find it in the docs. It’s possible to return “false” from event.droppedBefore() and in this case, dropped DIV element will be returned to source location. Hi! Great library! It’s really coming in handy for a class project. Question: Is there a way to tell which cell an element was dragged from? I know how to get the cell it was dragged to, but not the other way around. I read your documentation, but couldn’t find what I was looking for. Thanks! in event.dropped() handler you can get all needed info from REDIPS.drag.td property – please look to the documentation or search examples for the “rd.td.source” in prepared examples. In short, rd.td contains reference to previous, source, current and target table cell. I figured out the answer to my previous question! I found it in your documentation, and it works great. I have another question. Right now, when I drag and drop content, it snaps to a specific part of the cell. Is there a way that it can drop exactly where my mouse drops it instead of snapping? Dropped DIV element will be always placed to the cell bottom. Currently there is no way to set position of dropped element (DIV element is simply attached as child element to the TD). This new version is awesome. 1. We are using 4 columns in the table. The first column is the Label, second column is the Data (i.e. textbox, date, dropdown…etc). Same for the remaining 2 columns. Is it possible to allow dragging 2 columns together since they are in a pair? 2. After completing the dragging, the JSON data for the positions will be generated. Is it possible to load these positions such that the ordering will change upon the page is loaded? I want to say thank you for your Redips library. I am facing one problem here, Drag and Drop not working both tables are not in the . But as per my requirement the left side table in one container and another one some other container. So please help me out if both table(s) are not inside to enable content dragging. @Chee Chong – It’s possible to move only one DIV element at the same time. However, please look at the example12 or example17 (this one is a bit complicated) how to move more than one DIV element. saveContent() method can generate output in “classic” query string format or in JSON format – both formats contains and location (row / column) of DIV elements. So, if this location is saved to the server it should be preserved on page loading as well – it depends on page logic to correctly render HTML. Other approach is to use loadContent() method (in onLoad event) to display table content. This will help you to see dragging container and to verify if all tables are correctly placed inside container. is there a way of not losing the data once the page is refreshed. for example storing the user timetable so if he closes and reopens it all the data is there from last time. I’m new to programming sorry. 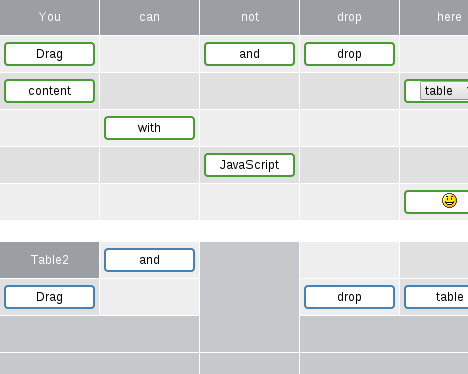 REDIPS.drag is a front-end library for dragging DIV elements inside HTML table. To save table content, it’s needed to call some sort of server side script. Script should accept table content and insert to database. To start with such scenario, it’s best to look example03 “School timetable” and apply modification. Example03 requires local Apache/PHP and MySQL database. Table content can be restored on the server side (like it’s done in example03) or with using REDIPS.drag.loadContent() method in example28. Hi, thanks for the library. It’s very useful. I have a problem when tables are larger than screen width. When the table is larger than the screen height there is no problem, you can scroll down and drop the div anywhere without problems but when I have to do horizontal scroll the div seems to not recognize that it is in a new column and it returns to its original position or to the nearest position to the right side of the screen (before make de scroll). I have also used the changed evento to show the position while the div changes and when the div arrives to the border of the screen and I scroll horizontally the changed event stops responding. Is ther any way to solve this issue. Thanks in advance. (and sorry for my poor english).